Quality Vietnamese street food that won’t break the bank. 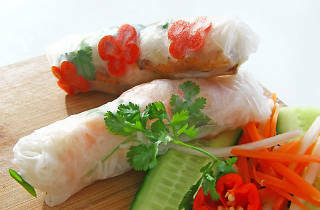 Sample the likes of pho and banh mi with a choice of tantalising fillings to eat in or take away. Serving authentic and tasty Vietnamese street food, Nom is a safe bet for those who are on the hunt for a more exciting lunch than the usual soup or sandwich that’s not too heavy on the wallet. The café is light and bright with pictures of street food being sold in Vietnam, as a reminder of where the food originates, and Nom’s owners – a husband and wife team – are passionate about the filling and flavoursome dishes they serve. Customers can choose from table seating, or watch the world go by from the counter, while takeaway is also available for those in a rush. The banh mi sandwiches (starting at £3.95) are very good, and feature a locally made baguette that’s crisp on the outside yet soft inside, packed with a choice of delicious fillings – either chicken, grilled fish, barbecue pork, hoisin duck or tofu and mushroom. Additional condiments such as coriander and chilli help to bring the food to life, and come as standard. 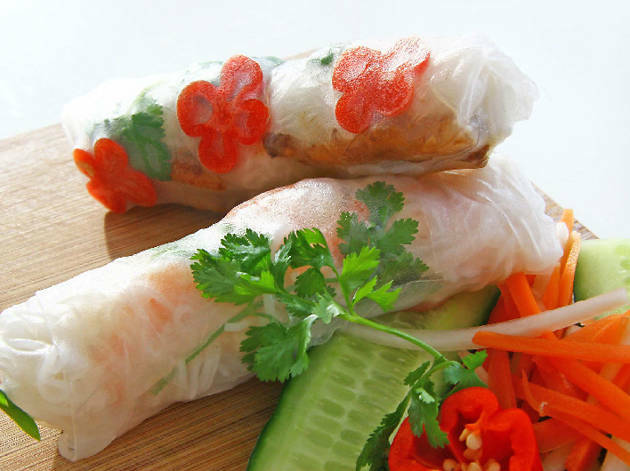 The menu also features summer rolls, pho (Vietnamese noodle soup) and noodle salads, all of which are freshly made, and vegetarians or those with gluten intolerances will also find themselves well catered to.